Across the ocean there is a magical land where some games debut months or even years before they do in the West—or sometimes never at all. But how do you get your hands on one of these mythical games from the Land of the Rising Sun? Kotaku East is here to help. Can Your System Play the Game? The first important step in importing a game is knowing whether or not your game console can even play the game you want. You see, even today, some games—both for home and portable consoles—are region locked. This means that they can only be played on systems of the same region—i.e., only North American released games can be played on a North American system. Thus, other than modifying your console in some way (which is a whole different topic that I won’t be getting into it here), you’ll need to buy a Japanese console to play region locked Japanese games. Sony: While games for both the original PlayStation and PlayStation 2 are region locked, ever since the release of the PlayStation 3 in 2006, games for Sony consoles have been region free—with two notable exceptions. This means if you are planning on importing for the PlayStation 3, PlayStation 4, PlayStation Portable, or PlayStation Vita, you are good to go. On the portable end, however, it’s been the opposite for much of Nintendo’s history. Games for the GameBoy, GameBoy Color, GameBoy Advance, and Nintendo DS are region free. However, games for the Nintendo DSi and Nintendo 3DS are region locked (though both systems can still play DS games of any region). Microsoft: Region locking on Microsoft systems is a little more complicated. Games for the original Xbox are region locked. Games for the Xbox One are not (except in China). But games for the 360 vary not only from game to game, but from console region to console region as well. Thus for importing 360 games, it’s best to check a compatibility chart—like this one—for any game you want to purchase. Will You Be Able to Understand the Game? While it may be a bit superfluous to say this, Japanese games are in the Japanese language only the vast majority of the time. So if you’re wondering if the game you want has English in it, the answer is probably “no.” Moreover, while action games or platformers will probably be playable even if you lack Japanese language skills, anything story heavy like an RPG or visual novel is probably not worth a buy. However, it is true that in some cases—like Capcom, Platinum, and Arc System Works games—English has been known to come on the disc. So if you want to check to be sure if your prospective buy has English or not, these awesome lists for the PS3, PS4, Vita and Xbox 360 may give you the answers you seek. Now that you know whether or not the game you want can play on your console and if you’ll be able to understand enough to play it, it’s time to buy the game—but where to buy? You have several options. There are several online shops that get their Japanese game stock quickly and ship worldwide for around the same price. Play-Asia (which I have personally used for years) and YesAsia tend to have free shipping for most countries. AmiAmi and J-list while not having free shipping are other reliable options, especially if you are interested in ordering figures or other related merchandise as well. Just be warned, getting your game can take more than a month from any of these places (if you choose the slowest shipping speed) and things like cancellations and returns can be problematic and time consuming. Alternatively many countries have their own import game stores if you're interested in dealing with a store in your own country instead of one in Asia. But if the game you want is on a Sony system and you care about getting it quickly, (and don't care about physical media) buying on the PSN really is the way to go. After making a Japanese PSN account, all you need to do is find the game on the Japanese PSN, buy it, and download it. However, unless you have a Japanese credit card, you’ll need to buy a Japanese PSN card. Luckily, stores like Play-Asia sell Japanese PSN card codes and send the codes via email as soon as you order—though for an expected markup. So you have your game. You begin playing it. You love it. But somehow you get stuck. What do you do? A good first stop for help is the GameFAQs message boards. There are always a few gamers playing the newest Japanese titles; so you’re likely to run into someone able to get you out of your sticky situation. On the other hand, if you have a little bit of Japanese language knowledge, you can likely find the answers on your own by visiting the Japanese side of the net. However, because there is no large centralized site like GameFAQs, you’ll have to Google a wiki for the game where the contributors have come together to make a walkthrough. Most games have at least one or two wikis with this sort of information on them. Well, I hope you have found this guide on importing useful. 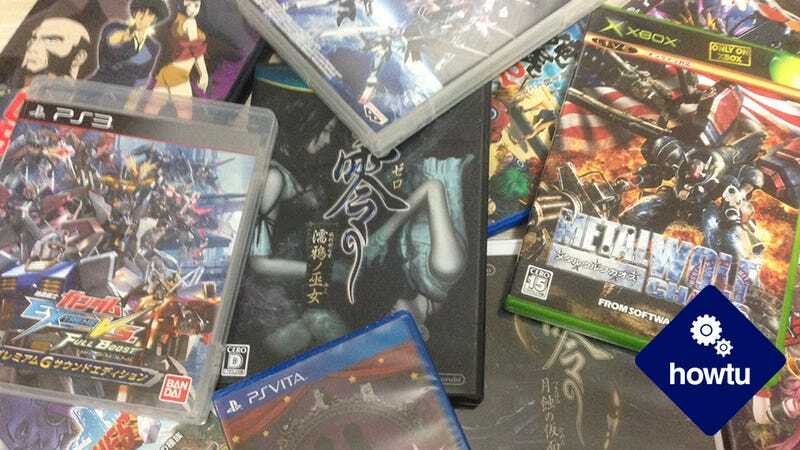 Enjoy your import Japanese games! If you have any questions, be sure to ask them in the comments and I’ll see what I can do.